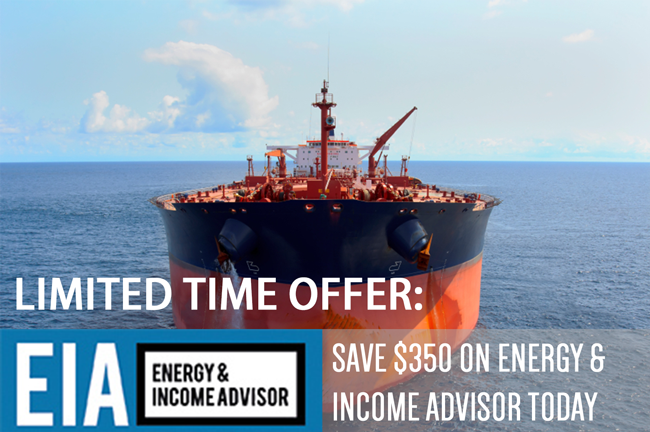 Sixteen of the more than 90 Canadian energy companies that we cover in Energy & Income Advisor have slashed their dividends since oil prices peaked last summer. Four of these names eliminated their payouts altogether. In US dollar terms, this Not So Sweet 16 has posted an average loss of 63.6 percent since June 30, 2014. 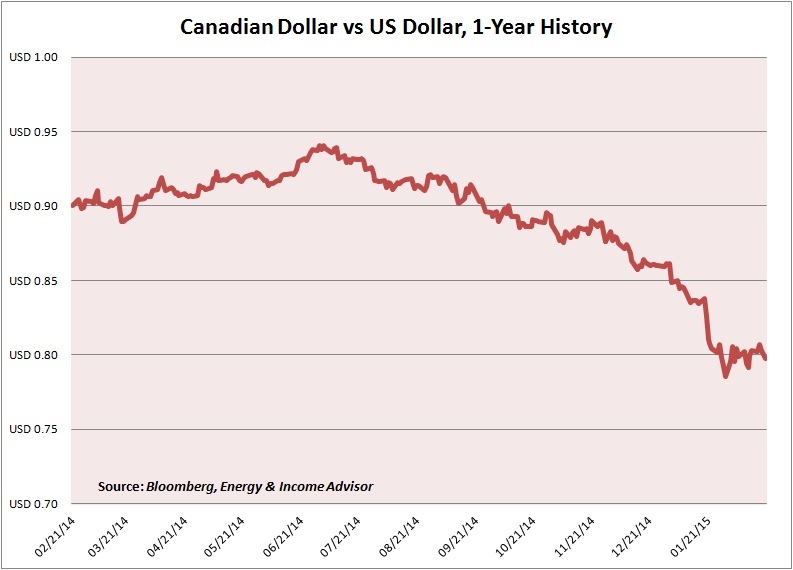 The severe downdraft in oil prices and subsequent dividend cuts has taken their pound of flesh from these stocks, but the Canadian dollar’s weakness relative to Uncle Buck hasn’t helped matters. This damage dwarfs the pain that investors suffered during the Halloween Massacre of 2006, when the Canadian government forced many energy-focused income trusts to convert to corporations. It is, however, very much akin to the shellacking that Canadian producers—trusts and corporations alike—suffered when commodity prices collapsed in late 2008 and early 2009. Should investors prepare for a V-shaped recovery along the lines of 2009, or the U-shaped recovery that occurred after oil prices crashed in 1986? Media buzz and inflows to exchange-traded funds (ETF) suggest that many investors have bought the hype and the dip in expectation of a V-shaped rebound. Unfortunately, conditions on the ground don’t justify such a sanguine outlook. 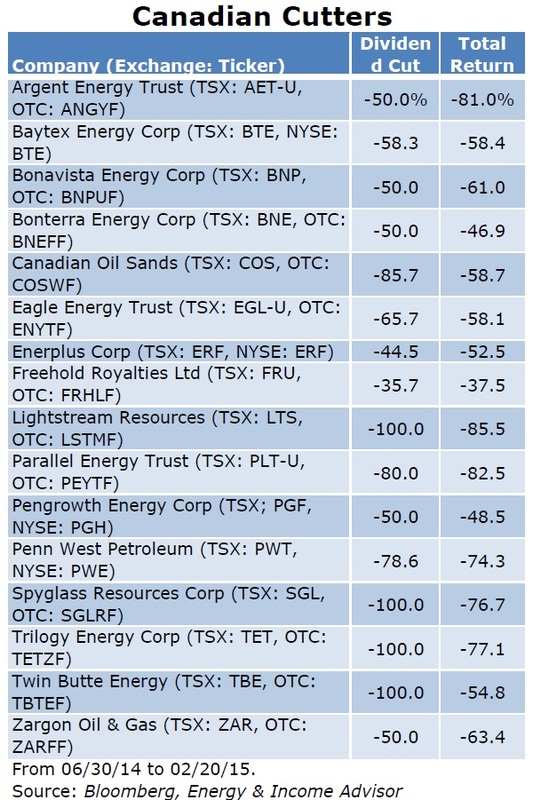 I’ve followed Canada’s energy patch for almost a decade and continue to cover these stocks as part of the more than 350 names that we track in Energy & Income Advisor. Earlier this week, we updated our comments and ratings for the Canadian companies that have reported fourth-quarter results. 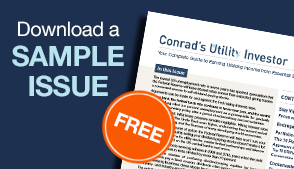 (Energy & Income Advisor subscribers should consult our International Coverage Universe. Non-subscribers can click here to see a list of the companies included.) Here are some of our key findings from earnings season north of the border. Canadian producers continue to adjust planned capital expenditures and dividend policies to reflect average West Texas Intermediate (WTI) crude oil prices of $50 per barrel in 2015. 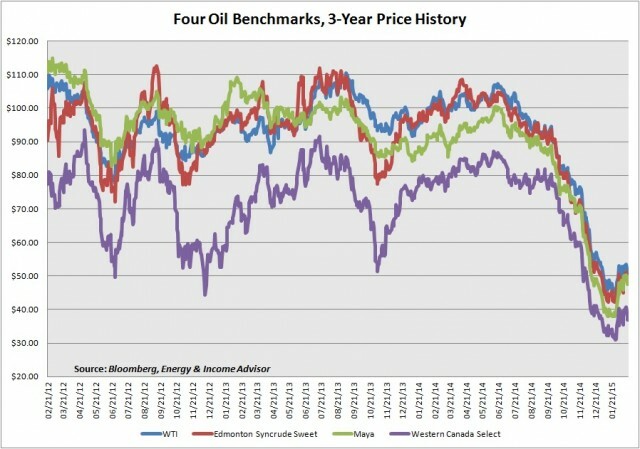 Only a few months ago, these price decks called for oil prices in the neighborhood of $60 to $70 per barrel. Bear in mind that Western Canada Select and Edmonton Sweet Syncrude historically have traded at a discount to comparable grades of crude oil because of growing production, insufficient takeaway capacity and their distance from key North American oil hubs in the Midcontinent and Gulf Coast. Canadian producers that rely heavily on rail to ship their volumes to the US will feel the pain the most, though a number of terminal expansions in the Pacific Northwest would offer access to overseas markets—a development that would provide a modicum of relief. Expect the handful of companies that haven’t updated their guidance in recent months to make similar adjustments, as Enerplus Corp (TSX: ERF, NYSE: ERF) did earlier this week. Most companies that have updated their guidance to reflect average WTI prices of $50 per barrel still anticipate flat or higher output this year. 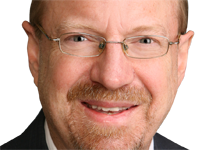 Enerplus, for example, slashed its dividend by 44.5 percent and its planned capital expenditures by 24 percent from its previous plan of CA$480 million—a 40 percent reduction relative to 2014. Management’s production guidance calls for the company to flow between 93,000 and 100,000 barrels of oil equivalent per day in 2015; the midpoint of this range represents a 6 percent decline from the 103,130 barrels of oil equivalent per day that the firm lifted last year. And if you include wells that Enerplus shut in during the fourth quarter, output would have been flat relative to 2013—even after planned asset sales. Even marginal producers appear committed to doing everything in their power to avoid cutting their output outright. Canadian Oil Sands (TSX: COS, OTC: COSWF) in late January slashed its quarterly dividend by almost 86 percent to CA$0.05 per share. But the Syncrude facility that contributes substantially all of the firm’s cash flow is expected to maintain its production rate of 35 million to 40 million barrels, despite elevated costs. Exxon Mobil Corp (NYSE: XOM) and the other deep-pocketed energy companies that own equity in the Syncrude project will ensure that the facility maintains its current utilization rate. Even upstream outfits one false step from Chapter 11 don’t expect to cut back production. Lightstream Resources (TSX: LTS, OTC: LSTMF), for example, eliminated its dividend in January and appears to be on the verge of a liquidity crisis, despite a series of asset sales last year. Nonetheless, the trouble company produced 36,400 barrels of oil equivalent per day roughly equal to what it pumped in fourth quarter 2014. Producers on the brink feel the pressure to produce even more in a desperate bid to generate more cash flow. Of course, the same observation applies to producers south of the border, with Apache Corp (NYSE: APA) standing out as one of the few names to guide for lower output this year. Vanguard Natural Resources LLC (NYSE: VNR), one of the publicly traded partnership covered in our MLP Ratings table, recently slashed its monthly distribution by 44 percent, but guided for 3.6 to 3.98 million cubic feet of natural-gas equivalent production per day in 2015—an increase of 10 percent to 21 percent. Several of the world’s major integrated oil companies anticipate sharp production gains over the next few years, fueled by the start-up of long-lived projects. Chevron Corp (NYSE: CVX), for example, has announced a massive rollback of capital spending between now and the end of 2017, including a $7 billion reduction for 2015. But the company still expects to grow its overall hydrocarbon production over the next three years. Total (Paris: FP, NYSE: TOT) has also guided for an 8 percent uptick in production this year—an impressive feat after halting spending on US shale gas projects, cutting capital expenditures by 10 percent and selling $5 billion worth of assets. Despite the dramatic wave of cuts in dividends and capital spending since oil prices started falling last summer, a commensurate drop in actual production won’t emerge right away—continued growth appears likely for the time being. Unless global demand helps to absorb these new supplies, prices will head lower, putting the screws to high-cost producers. On the plus side, drilling and services costs have dropped amid excess capacity and pushback from producers, a welcome tailwind for upstream operators. 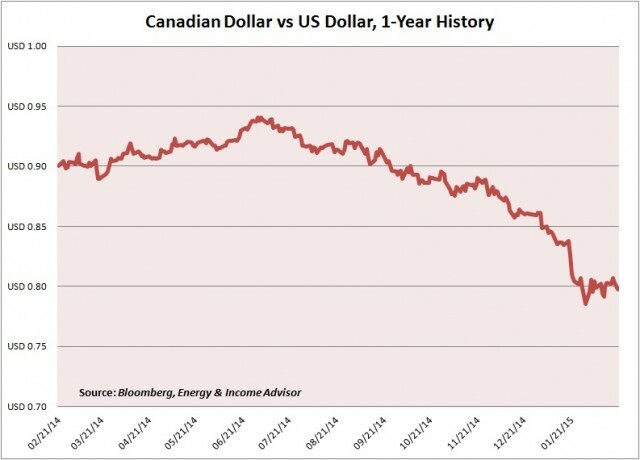 Canadian and Australian producers benefit even more because of weakness in their home currencies and output that’s priced in US dollars. For example, Peyto Exploration & Development Corp (TSX: PEY, OTC: PEYUF), one of Canada’s lowest-cost gas producers has guided for a 20 percent reduction in drilling and services expenses. Falling costs increase companies’ appetite and ability to maintain and grow production despite lower oil prices. Canadian midstream companies stand to benefit from sustained production and the country’s lack of takeaway capacity, which gives Pembina Pipeline Corp (TSX: PPL, NYSE: PBA) and its peers ample opportunity to pursue projects that eliminate transportation bottlenecks. Earlier this month Pembina Pipeline announced a plan to expand the capacity of its Vantage system by 70 percent. This project increases the company’s expected capital expenditures to CA$1.9 billion, a record level of investment. 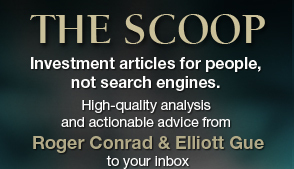 Investors hoping for a rising tide to raise all ships likely will be beached for a while, in the best-case scenario. 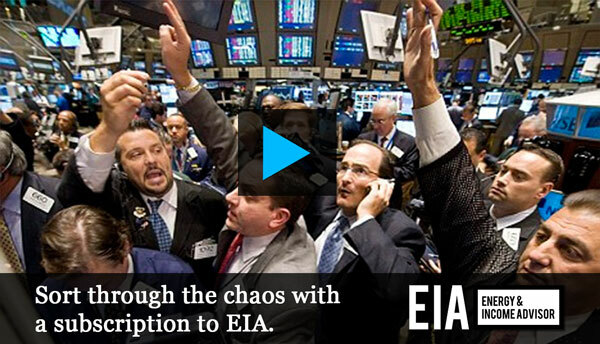 There are opportunities in the energy sector, but selectivity is critical. Case in Point: The three master limited partnerships that we added to our Model Portfolio on Dec. 1, 2014, have generated an average total return of 16.7 percent, easily besting the Alerian MLP Index’s 0.9 percent loss.